Tanna, an island of Vanuatu, was beaten and battered when it took a direct hit from Cyclone Pam. What was a lush environment is now brown and cluttered with debris. Huge trees look more like roots growing towards the sky—their leaves stripped and upper branches snapped off. Wreckage is littered everywhere. On Thursday, Samaritan’s Purse brought help to a village in Tanna as part of our large-scale emergency response to the storm. Villagers received aid that included soap and other hygiene materials, which will aid their families in staying healthy in the wake of this traumatic event. Samaritan’s Purse brings hygiene items to a village in Tanna. Tanna is one of the largest islands in Vanuatu, with a population of around 28,000. It is now home to many hurting people. They are cut off and isolated, with no working communications systems and a lack of electricity. Most people are subsistence farmers, living off the land in order to survive, but their crops are now destroyed or completely ruined. The majority of homes are either severely or completely damaged. 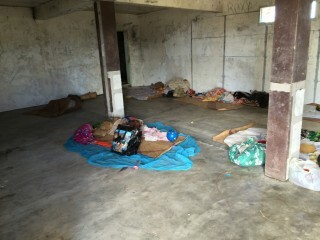 Many families are sleeping outside. 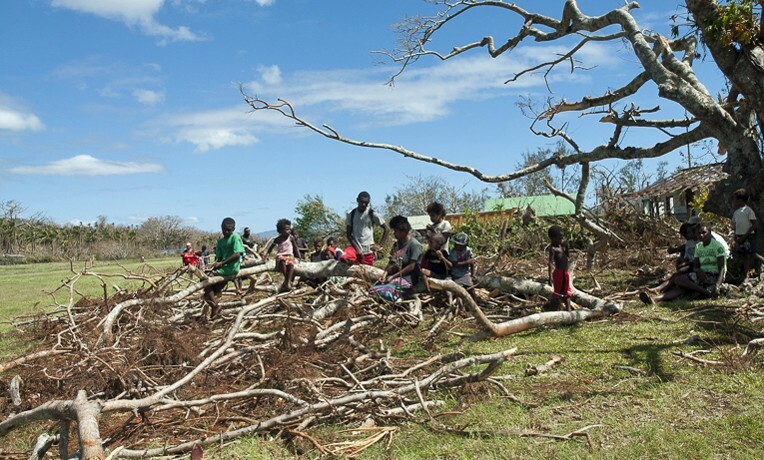 Natasha, her husband, and two daughters lost their home to Cyclone Pam. She told us that the people of Tanna are used to storms, so to hear that a cyclone is coming does not create great concern. However, Natasha said that a storm like Cyclone Pam has never hit Tanna. As the storm approached, her family did not take notice until it was almost too late. The force of the winds and rain increased throughout the night on Friday, and by morning Natasha said it was at its worst. Their house was shaking, and her husband knew that he had to get his family out. He took their daughters to his brother’s house next door. On his way back to get Natasha, the house collapsed with her inside. Thankfully the door was open, providing a way for Natasha to escape, with the help of her husband. They joined their daughters at the brother’s house, along with their grandparents, whose home also came apart. Some families who lost their homes are sleeping outside; others are staying in shelters like this. Cyclone Pam also completely destroyed a garden that Natasha’s neighborhood depends on for food. It grew bananas, yams, and manioc. The storm carried away everything except about a week’s supply, leaving them on the verge of helplessness. The aid that Samaritan’s Purse provided will help meet this community’s immediate needs, but the road of recovery is a long one. Despite their loss, hope was evident in Natasha and in this village. While we were there, another member of the village named Clifford thanked our staff for the support and the care shown to their community. Samaritan’s Purse will continue to bring aid to many more across Tanna and other islands of Vanuatu as people search for hope and rebuild their lives. The Gospel of Jesus Christ will be shared along with the physical aid that is so desperately needed.